Plant some GREEN in your community! iTrees.com is proud to partner with Spring Grove Nursery for our CommuniTrees Partner Program available to all communities across Illinois. 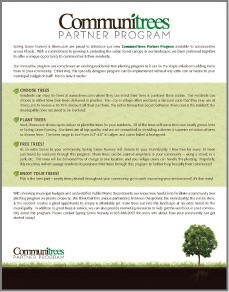 The CommuniTrees Partner Program benefits residents of communities, along with the community itself. For every 10 trees purchased by all residents of CommuniTrees partner communities, iTrees.com and Spring Grove Nursery will donate trees to be planted around the community. That’s not all though, residents will be provided a coupon code to receive 10% off their order. iTrees.com and Spring Grove Nursery are committed to growing & protecting the urban forest canopy in our landscape to offer a unique opportunity to communities & their residents. 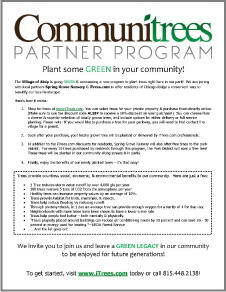 Our CommuniTrees Partner Program can compliment an already existing residential tree planting program or it can be the single solution to adding more trees to your community. Browse through our website, select & purchase trees online. You can choose to have your trees delivered or planted. All participating village’s or cities will be provided a discount code that may be used to receive a 10% discount off your purchase. Next, iTrees.com shows up to deliver or plant your trees. All of the trees will come from our locally grown farm at Spring Grove Nursery. Our trees are all top quality, and we are committed to providing a diverse & superior selection of trees to choose from. As an extra bonus to your community, iTrees.com and Spring Grove Nursery will donate to your village, city or municipality 1 free tree for every 10 trees purchased by all residents of our program. The trees can be planted anywhere in your community-alongside a street, in a park etc. The trees will be delivered free of charge to your village, city, or municipality. Our goal is to encourage resident to purchase trees through us to further the beauty of their communities. 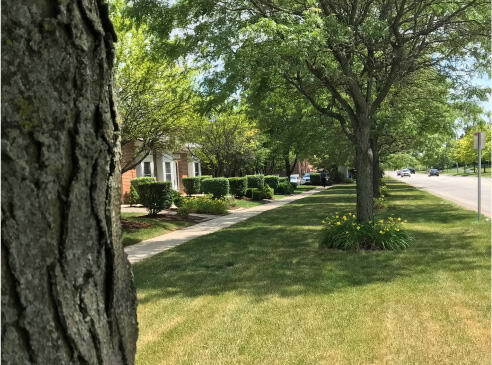 This is the best part- newly planted trees throughout your community improve the landscape of your community and improve the environment. It’s that easy!